Preacher and physician; born at Brilon, Westphalia, Oct. 23, 1825; died in Chicago Aug. 22, 1860. He studied in Bonn and Heidelberg, and graduated (Ph.D.) in 1844. In 1847 he was elected associate preacher to Dr. Holdheim of the Reform Congregation of Berlin, and later accepted a professorship in the Jewish Teachers' Seminary at Münster, in which city he also officiated as preacher. He remained there for three years. 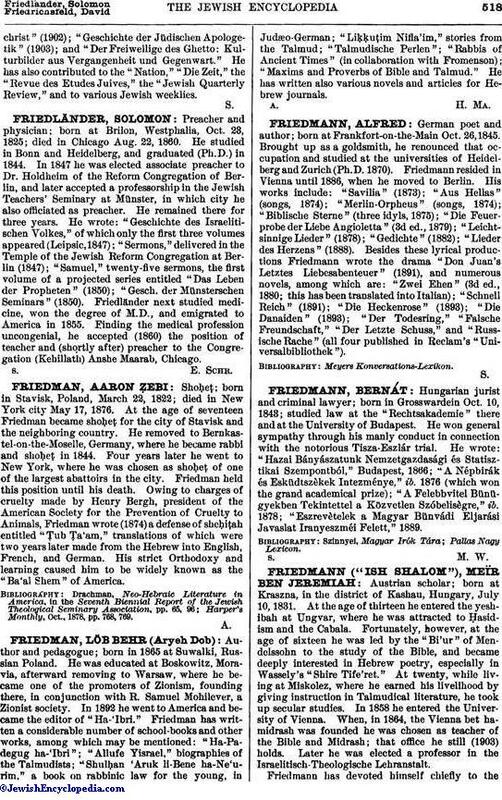 He wrote: "Geschichte des Israelitischen Volkes," of which only the first three volumes appeared (Leipsic, 1847); "Sermons," delivered in the Temple of the Jewish Reform Congregation at Berlin (1847); "Samuel," twenty-five sermons, the first volume of a projected series entitled "Das Leben der Propheten" (1850); "Gesch. der Münsterschen Seminars" (1850). Friedländer next studied medicine, won the degree of M.D., and emigrated to America in 1855. Finding the medical profession uncongenial, he accepted (1860) the position of teacher and (shortly after) preacher to the Congregation (Kehillath) Anshe Maarab, Chicago.